Cannonball Read now has a shop on RedBubble! Two designs are now available in different kinds of apparel, bags, stickers, journals, mugs, and more. A portion of each sale goes towards our mission. You can also support our cause by making a donation, or volunteering your time. Contact MsWas with questions about any of the below merchandise, or how you can help. 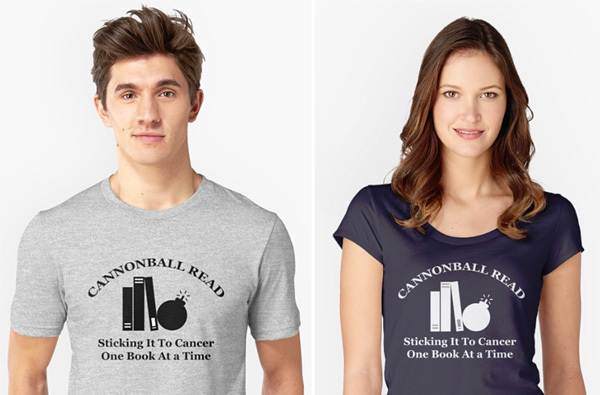 Our newest design features a cannonball, a stack of books, and our slogan Sticking It To Cancer One Book At a Time. Molly Wasielewski created this design for CBR; for more of her art, head over to her online portfolio. This design is in our shop twice, in both black and white, to give you a variety of color combinations. Congratulations to Shannon Damiano of Communications High School in Wall, NJ whose design for our tenth anniversary was the winning entry. Now available through RedBubble, find this design on different kinds of apparel, bags, stickers, journals, mugs, and more available for sale. A portion of every purchase goes towards our mission to stick it to cancer, one book at a time! 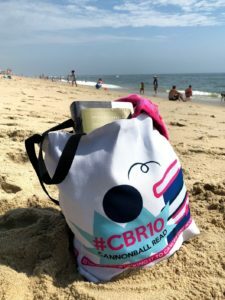 Share the post "Cannonball Read Merchandise"